Bengaluru : Kalki Kannada, a recently launched Kannada General Entertainment Channel, is currently the talk of the town in Karnataka. The channel that was unveiled on the auspicious occasion of Vijayadashami this year, is the launch pad of White Horse Network Services Pvt. Ltd.(WHN), the fastest growing Media Business in South India offering unique content in Entertainment Space. WHN, floated a year ago by renowned media industry veteran Mr. P. Kailasam, offers complete entertainment through Kalki Kannada that is led by a team of professional expertise coupled with dynamic young innovative thinkers implementing media operation and services with current trend and sets. WHN’s high-end infrastructure, with well-equipped state-of-the-art studio and latest editing technology and equipments, is packed to offer complete production packages with HD quality content to the viewers of Kalki Kannada. To begin with, the channel’s USP is that it offers completely original shows with no remakes from any other shows of any language. The channel does not only offer an innovative and interesting mix of shows across various genres while catering to its diversified audience, but it also promises to soon launch a show completely dedicated to women. Mr. P Kailasam, CEO of WHN, says, “We have a separate team dedicated towards understanding and working based on the tastes and demands of Kannada viewers across different age groups as we at Kalki Kannada strive to offer content with a unique approach while maintaining the true Kannada culture at large”. 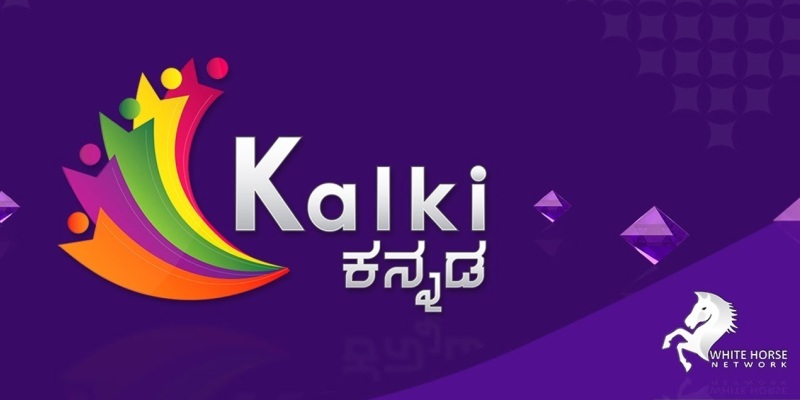 After extensive research on the viewership habit, Kalki Kannada has launched shows across various genres including a complete Morning Band on Devotional Shows, Afternoon Band on Cookery Shows, Evening Band on Drama and Reality Shows as Weekend Special. To name some of the Non-Fiction Shows, ‘Abhishekam’, is an early morning Devotional Show that offers a visual tour of some of the exquisite temples of Karnataka along with ‘day specific’ devotional songs and abhishekam based on particular God of the day. ‘Vishwaroopa’, is a Devotional Show where Philosopher and Astrologer, Dr.Savithru Sharma, interacts with the viewers and covers every aspect of faith, coupled with solutions for personal problems, daily predictions and a guide to daily ritualistic practices. ‘Paddu’s Kitchen’, is an exclusively vegetarian cookery show in which Padmaja, the most popular onscreen mom, presents simple home cooking with celeb chefs & signs off with her simple recipes. Simple breakfast, main course and dessert items are taught by yet another television celebrity, Srinivas Prabhu who joins hands with Paddu. ‘Pani Puri with Murali’, is a fun filled live chat show hosted by Popular TV Anchor ‘Murali’, where he chats with celebrities and achievers over Paanipuri. Viewers can also interact with guests and anchors over the phone in this live show. ‘Kalki Express’, a reality game show hosted by a popular comedian, M.S. Jahangir, travels across 30 districts of Karnataka reaching out to the viewers to try their Luck. Simple games played by the participating families can make them earn handsome money. ‘Puttamalli’, is the story of a young village girl who, in a turn of fate, marries a gentleman much older than herself and is settled in a big city. The drama revolves around how the entire family of the boy helps to transform the girl to adjust to her new life. ‘Sevanthi Sevathi’, is A half-sisters’ drama with a repenting father and his two wives : rich & arrogant second wife and poor struggling first wife. The sisters’ paths cross on various occasions while they are completely unaware of their relation. The plot revolves around how the two sisters resolve all their family issues. ‘Anubandha’ is a story based on love, friendship, relationships and of unspoken feelings hidden by a mask. The story revolves around a mother and daughter who love each other a lot. In a turn of fate the mother loses her daughter but soon finds another girl almost like her daughter and to whom she gives her daughter’s face so that the whole world thinks that her real daughter is alive. While all the other Fiction shows are family dramas, Kalki Kananda is soon coming up with a Socio-mythology Drama called ‘Amnoru’. ‘Amnoru’, is an intense drama between the good and the evil. The show while using elements of devotion, faith, black magic and mythology is about a devout girl who has special powers and her immense faith in God saves her husband’s life. Apart from the various interesting shows, Kalki Kannada has also bagged some all-time famous Kannada Movies which will be aired for its audience as Weekend Specials. Last but not the least, the channel promises its audience 60 hours of Complete Entertainment by way of all Original Programmes in HD quality to grip viewers across all age groups.